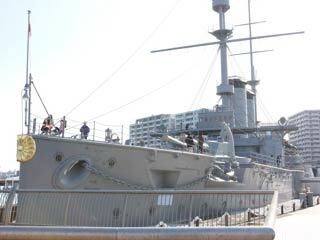 Memorial Ship MIKASA (三笠) is located in Yokosuka. MIKASA was the battleship built by Vickers Shipyard in England and was commissioned in 1902. At the Battle of the Sea of Japan in the Japanese-Russo War, MIKASA fought valiantly as the flagship of the Combined Fleet under Admiral Heihachiro Togo ( 東郷平八郎), Commander-in-Chief of the Combined Fleet. This ship is now preserved as the museum which still keeps many original parts of the ship and displays many historical items relating to the Japanese –Russo war as well as Admiral Togo's personal mementos. At the Battle of the Sea of Japan in the Japanese-Russo War, MIKASA fought valiantly as the flagship of the Combined Fleet under Admiral Heihachiro Togo, Commander-in-Chief of the Combined Fleet. ADM Togo always led the fleet and fought daringly against the Russian Fleet which was deployed from the Baltic Sea, and greatly contributed to this historic and overwhelming victory in the history of the naval battle. While MIKASA was in the port of Sasebo after the battle, she sank unfortunately due to an accidental explosion in her shell magazine, but she was re-floated and repaired. Then she returned to the front line and accomplished her mission of the maritime defense. Although in 1923 the Washington Naval Conference proposed that MIKASA was to be decommissioned and scrapped, the Conference approved to preserve her as a memorial ship. In 1926, MIKASA turned out to be a commemorative Memorial Ship at the current location after her renovation for a year and half.